Wow, news from the whole trifecta of companies covered on this blog! The Adventure Company has released A Vampyre Story to North American retailers, so US and Canadian gamers can finally get the game if they wish to have a nice box on their shelf. The picture at the top of this post is a screenshot sent to The Pumpkin Post of a planned A Vampyre Story easter egg that was cut due to time constraints. 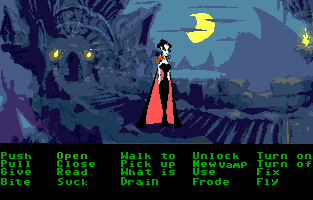 It is of an 8-bit version of the game that utilizes a reproduction of the SCUMM interface as seen in Maniac Mansion. I was wondering what was going to happen with a retail release of Season Two of Sam & Max. True, there is a DVD release for season purchasers at Telltale's website, but Season One got a retail release published for PC and Wii by The Adventure Company. It seems Season Two will see Telltale getting a bigger publishing partner. Atari will be publishing the game for PC retail, and Wii fans will be happy to know that Season Two is getting a Wii release as well, also to be published by Atari.